The joint that most frequently develops arthritis is the knee, and osteoarthritis is the most common form of arthritis in the knee. This arthritis typically involves a slow degenerative process of “wear-and-tear” and can become more acute under certain conditions such as stair climbing, squatting, or colder weather. The warm weather we enjoy in and around Fallbrook can offer relief and is another reason those who suffer choose to move to warmer climates. Osteoarthritis is brought on mostly by inflammation of the cartilage in the knee joint which gradually wears away to the point where there is no cushion left for the knee sockets. Gradually, pain and swelling begins as well as cracking or popping sounds, and even a grinding sensation in the knees. When the pain becomes so severe that it interrupts sleep or prevents movement, it’s time to take action and make an appointment with an arthritis doctor. • Joint Injections: The aspiration (draining) and injection of muscles and joints can provide quick and significant pain relief. 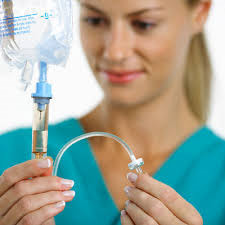 • Infused Medications: Our skilled infusion nurses and physicians will administer and monitor the intravenous medications in our comfortable infusion suites. • Heel Ultrasound: Our physicians use a combination of Heel Ultrasound and DXA (Dual Energy X-ray Absorptiometry) machines to diagnose and treat osteoarthritis. At Southland Arthritis, we have more than 15 years experience of treating Fallbrook patients with osteoarthritis and related chronic pain conditions. Call us today for an appointment, or visit our website for more information. A: You can still have active an crohn’s inflammatory arthritis even if your crohn’s is stable on humira. You might also have a secondary arthritis such as osteoarthritis in addition to the Crohn’s arthritis. You should followup with a Rheumatology for further evaluation. Q: Do any of the doctors treat Psoriatic arthritis as caused by a microbial infection? A: All of our doctors treat Psoriatic Arthritis. The exact etiology of Psoriatic Arthritis is unclear however there is data to suggest that microbial infections can cause Psoriatic Arthritis. We do not use antibiotics to treat Psoriatic Arthritis. We typically use medications such as methotrexate and anti-tumor necrosis factor drugs. Q: Hi, I have a diagnosis of osteopenia of my right hip. I am 53 y.o., female, lacto-intolerant, never bore a child, have never used drugs, never excessively drank alcohol. Is it true my number one defense is to exercise using weights. I understand some controversy of the benefit of use of calcium supplements? A: Weight bearing exercise does improve bone density. There is some controversy regarding calcium supplements. The United States Preventative Services Task Force recommended that post-menopausal women do not need to take supplemental calcium or vit D, however this recommendation does not apply to people with Osteoporosis or Low vit D.
Q: Without being able to pinpoint when I actually “hurt” my back, I now have pain and spasms from my buttocks all the way down both legs as far as the back of my calves. I have tried ice and stretching exercise on the floor. I will go for a few hours with relief (also use Advil) but then my legs for no given reason will just spasm and “lock” up. A: There are several possibilities for your pain. Pain that originates from the lower back and radiates down the leg can be secondary to lower back spasms or could be directly from the spine. Spinal pain in this situation can be divided into broad categories, “wear and tear” such as Osteoarthritis, spinal stenosis which is narrowing of the spinal cord, disc herniation, traumatic arthritis, rarely infectious arthritis and inflammatory arthritis. You need to see a doctor for a thorough history, physical exam, imaging tests and possibly blood tests. Treatment will depend on the underlying etiology of your back pain and could include medication for nerve pain such as gabapentin, lyrica, norepinephrine/serotonin reuptake inhibitors such as cymbalta, oral/topical anti-inflammatory medications, steroid injections, stretching exercises and surgery in severe cases. Q: After three months of both severe shoulder pain, after two falls, I requested an x-ray. The results were that I have Oesteopenia. The pain is severe and wakes me up in the middle of the night. What should my next step be in order to lessen the pain? A: Osteopenia is a mild thinning of the bones and can be suggested by an x-ray but needs to be diagnosed by a tested called a bone density scan (T score between -1 and -2.4). Osteopenia does not cause pain and is not related to your shoulder pain. If the X-ray did not show arthritis in your shoulder and if your primary care physician can not determine the etiology of your shoulder pain, you should see a Rheumatologist or an Orthopedic surgeon. Possibilities for your shoulder pain include arthritis in the shoulder joint, bursitis, inflammation of the biceps tendon as it inserts into the humerus, rotator cuff tear or pain radiating from the neck if you have cervical spine arthritis. You might need an MRI. Treatment will depend on the underlying etiology of your pain and options may include steroid injections, anti-inflammatory medications, exercises, nerve blocking or narcotic pain medication and surgery. Q: Do you treat people with Raynaud’s Phenomenon? A: Yes, we treat people with Raynaud’s Phenomenon. Raynaud’s is a condition that results in poor blood flow, typically to the hands and feet. The decreased blood flow is exacerbated by cold temperatures and can cause color changes and pain in the digits. As Raynauds progresses, it can cause gangrene to the affected digits. When evaluating someone for Raynauds, it’s important to determine if they have primary Raynauds or Raynauds secondary to a connective tissue disease such as lupus or scleroderma. The treatment for Raynauds is to improve blood flow to the affected extremity by keeping the hands and feet warm and we typically use oral or topical medications as well. The medications work by dilating the blood vessels so your blood pressure needs to be monitored because a common side effect of medications used to treat Raynauds is low blood pressure. The aspiration (draining) and injection of muscles and joints can provide quick and significant pain relief for a variety of conditions such as Rheumatoid Arthritis, Psoriatic Arthritis, Lupus, Osteoarthritis, Gout, Fibromyalgia, Tendonitis and Bursitis. The injection site is cleaned and prepped and the injection site is anesthetized with a numbing spray (ethyl chloride). Depending on the type of injection, we may administer an additional numbing medication such as marcaine or lidocaine. The affected area is typically injected with steroids but we also provide viscosupplement injections for knee osteoarthritis. Viscosupplementation is the injection of a gel-like substance into the knee joint which acts like a lubricant. Viscosupplement injections are given once per week for 3 weeks in a row. Results from viscosupplement injections may vary depending on the severity of your knee arthritis however we have many patients who report decreased pain and increased mobility in their knees after completing the viscosupplement series. Many conditions such as Rheumatoid Arthritis, Systemic Lupus Erythematosis, Psoriatic Arthritis, Ankylosing Spondylitis, Osteoporosis and Osteoarthritis can be treated with intravenously infused medications. Our skilled infusion nurses and physicians will administer and monitor the intravenous medications in our comfortable infusion suites.